Want to be a Wisconsin licensed cheesemaker? Wisconsin Cheese Originals announced this week applications for its 2013 Beginning Cheesemaker Scholarship are available. The $2,500 award will help one aspiring cheesemaker earn his or her Wisconsin cheesemaking license and make new artisan, farmstead or specialty cheeses. Applications for the 2013 Wisconsin Cheese Originals Beginning Cheesemaker Scholarship are available for download at www.WisconsinCheeseOriginals.com. Applications are due March 15. The recipient will be chosen by a review committee and notified by April 1. 2012: Anna Landmark owns and runs a small-scale sustainable farm with her husband and children in Albany, Wis. After using the scholarship money to earn her cheesemaker’s license, Landmark plans to craft both fresh and aged sheep’s milk cheeses, including thistle-rennet cheeses, which will require her to develop her own rennet from thistle flowers. This type of cheese is currently only available via import from Portugal and Spain. 2011: Rose Boero, a dairy goat breeder in Custer, Wis., successfully obtained her cheesemaker’s license after receiving the scholarship in 2011. Today, she makes a variety of goat’s milk cheeses at Willow Creek Cheese and teaches classes in her home for amateur cheesemakers. She is developing plans to build her own cheese plant at her dairy goat farm, where she and her husband have raised Toggenburg dairy goats for 25 years. 2010: Katie Hedrich, a goat’s milk cheesemaker, obtained her license in 2010 after receiving the very first Wisconsin Cheese Originals Scholarship. At the 2011 U.S. Champion Cheese Contest, she took Best in Show for her goat’s milk cheese, LaClare Farms Evalon, and was named the 2011 U.S. Champion Cheesemaker, the youngest licensed cheesemaker to ever earn the title. She and her family are currently building a farmstead cheese plant on their farm near Pipe, Wis.
For more information about the scholarship, email me at Jeanne@wordartisanllc.com . My family has the darnedest time figuring out what exactly it is I do for a living. I grew up in a small town, moved away after college, and don’t get home very often. So on the rare occasions I go back for weddings or funerals, I often stand to the side and amusingly watch my father, a retired farmer, get asked by former neighbors and old friends what his two daughters grew up to be. My sister has it easy. “Well the oldest one’s a lawyer,” Dad will say with a big grin. And then he’ll go on to talk about how she owns her own law firm in Milwaukee and how she helps people who’ve been discriminated against at their jobs. He might even describe her latest case, or talk about a big company she just sued. My sister is a very good attorney. And that’s when the eyebrows furrow, the eyes squint, and the look of confusion starts. A slow inhale. A slower exhale. “Well …. she used to be a newspaper reporter. She was a real good reporter,” he’ll say. “She won lots of awards.” Pause. Longer Pause. “But now she works with cheese. I think she writes about cheese. I know she does some real nice events in Madison.” And then he’ll frantically search around the room to find me smiling at him, wave me over, and have me explain what exactly it is that I do. But therein lies the problem. Hell, even I have a hard time explaining what it is I do for a living. I’m a writer. I’m a storyteller. I’m also an event organizer. I like to write about cheese. I like to talk about cheese. I like to organize events around cheese. And, of course, I eat a lot of cheese. Mostly, though, I like to make stuff happen and then stand in a corner and watch it unfold. That’s what happened today when I wrote a little press release about a young woman who’s just starting out in the cheese world. I don’t think she even has any idea of what’s in store for her. But I can see it. Her name is Anna Landmark. 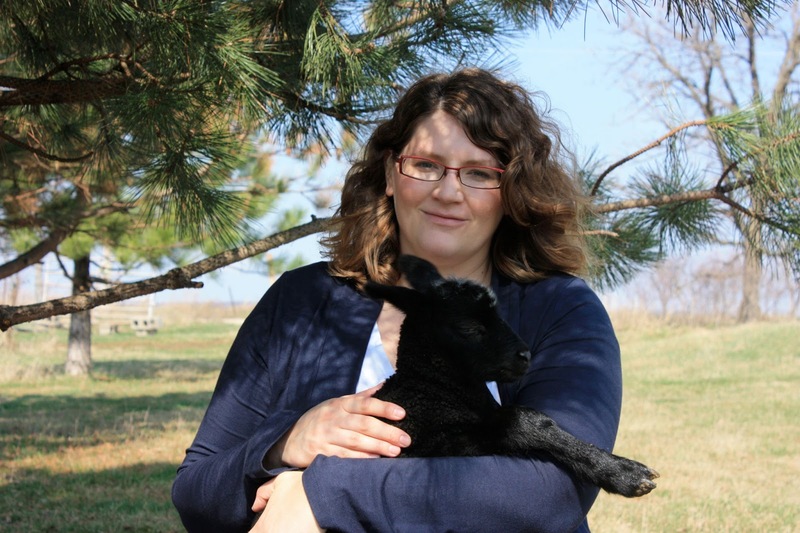 Today, she’s a policy research director for a Wisconsin non-profit organization, who with her husband, owns and runs a small-scale sustainable farm in Albany, Wis.
Five years from now, she’ll be an award-winning cheesemaker crafting original sheep’s milk cheeses and clearing a broader path for Wisconsin artisan cheese. She’s the kind of gal who’s going to put her own mark on the dairy industry, and she’s going to do it in style. You see, Anna was selected from a wide field of applicants for a $2,500 scholarship from Wisconsin Cheese Originals, an organization I started in 2009 to help consumers connect with Wisconsin cheesemakers. She is mid-way through the courses required for the cheesemakers license and is working to secure an apprenticeship this fall. As you know, Wisconsin is the only state in the nation that requires its cheesemakers to be licensed, an 18-month process that involves attendance at five university courses, 240 hours of apprenticeship under a licensed cheesemaker, and a written exam at the Wisconsin Department of Agriculture. While big and even medium-sized cheese companies can afford to put beginning cheesemakers through the licensing process, smaller, artisan companies, and especially those just starting out, can find the process daunting and sometimes, insurmountable. That’s why I started the scholarship in 2010 – to create a platform for beginning cheesemakers whom I am confident will go on to do great things if they can just get past the hurdle of getting their license. Past scholarship recipients include Katie Hedrich, a goat cheesemaker in Chilton, Wis., who went on to be the first and youngest woman goat’s milk cheesemaker to be named a U.S. Champion; and Rose Boero, a goat and cow’s milk cheesemaker in Custer, Wis., who will complete her cheesemaker’s license this spring. While all of this year’s scholarship applicants were more than well-qualified, Anna’s application stood out because it told a story. And perhaps because I myself am a storyteller, her story spoke to me. Anna’s story begins at her grandparents’ dairy farm in Mount Horeb, Wis., where a big block of Swiss cheese was brought out every morning for breakfast and then left on the table under a glass dome until after supper. Her story continues through the terrible milk prices of the 1980s, when she watched her grandfather become discouraged, eventually retire, and then discourage his grandchildren from ever getting into farming. Her story blossoms with the discovery that she loves to cook, and how that love led to making cheese in her kitchen (her first batch of mozzarella was so terrible she didn’t attempt to make cheese again for two years). And it ends with the story of buying a small property outside Albany in 2009 with her husband, where a new story is now starting: one of buying a gentle, stubborn, noisy Milking Shorthorn named Freckles who produced so much milk that Anna started making cheese just to use it all up. Then came along two Alpine dairy goats, and she made goat’s milk cheeses. Then heritage breed sheep, and finally sheep’s milk cheeses, where she found her true passion: to become a sheep’s milk cheesemaker. After she uses the scholarship money to earn her cheesemaker’s license, Anna plans to craft fresh sheep’s milk cheeses, and differentiate them from her cheesemaking idol Brenda Jensen’s cheeses, by draining the curd for a longer period of time and perhaps rolling the cheese in herbs and distributing it in various shapes. She’s also going to make aged sheep’s milk cheeses, including thistle-rennet cheeses, which will require her to develop her own rennet from thistle flowers. This type of cheese is currently only available via import from Portugal and Spain. I have no doubt she’ll accomplish all that and much more. Anna will be a cheesemaker, and she’ll be a good one. She says her grandfather is now enjoying watching her entry/return into the dairy and cheese world, but is still skeptical anyone on a small scale can really make a living doing it. Good cheesemakers can make a living doing it. And Anna will be good cheesemaker. I’m looking forward to watching her grow and discover all the things of which she’s capable, all of the things I see in her when she talks about making cheese. So perhaps that’s one way I can explain to folks what it is that I do: I help grow cheesemakers. But then again, that’s not going to be an easy career for my father to explain to the neighbors either. So I guess I’ll stick with being a writer who has a sister who is a good attorney. That’s good enough for me. Alert readers of The Cheese Underground might know that for fun, every year I run a little event called the Wisconsin Original Cheese Festival. In exciting news, tickets to this annual shindig, set for Nov. 4-5 at the Monona Terrace in downtown Madison, are now on sale to the public. While almost all of the dinners, tours and seminars have already sold out to members of Wisconsin Cheese Originals, those of you looking to attend the festival’s signature event: the Meet the Cheesemaker Gala, are in luck, as many tickets are still available. That’s because, in an effort to reduce the number of hate emails I receive from hostile would-be-ticket-buyers after the event annually sells out 6 weeks in advance, I’m ticketing it a bit differently this year and offering two different time slots, from 6 to 8 p.m., and 8 to 10 p.m. Each session will be limited to 250 attendees, allowing everyone to personally meet and greet cheesemakers in a relaxed and enjoyable setting. For those of you who’ve never attended the event, the Meet the Cheesemaker Gala is one of the only opportunities in the nation to personally meet nearly every Wisconsin artisan, farmstead or specialty cheesemakers and taste more than 150 of their cheeses. Also new this year (another attempt to limit hate email), cheese will be offered for sale at the event. Now you can taste and then purchase your favorite cheeses, all in the same venue! The fabulous Metcalfe’s Market will set up shop in a room adjacent to the Gala, offering many of the night’s cheeses and accompanying foods, including Potter’s artisan Crackers and Quince and Apple small-batch preserves. Of course, the Friday evening Meet the Cheesemaker Gala is just one of a wide array of events taking place during the annual festival. Other events include: creamery and dairy farm tours, private cheesemaker dinners, and tasting and educational seminars. All events require advance tickets and will sell out. A HUGE thank you to all sponsors of the Third Annual Wisconsin Original Cheese Festival, including: Gold-Level sponsors Klondike Cheese, World Import Distributors, Wisconsin Milk Marketing Board; Silver-Level sponsors BelGioioso Cheese, Dairy Business Innovation Center, Emmi Roth USA, Fromagination, Organic Valley, Uplands Cheese; Bronze-Level sponsors American Cheese Society, Crave Brothers Farmstead Cheese, Edible Madison, Fromartharie, and Meister Cheese, and Supporting Sponsors Hook’s Cheese, Hy-Vee Madison and Widmer’s Cheese Cellars.